The Edrington Group announced today (June 21, 2010) that Matthew Turner has been appointed brand controller for Highland Park. Matthew, previously marketing controller with The Macallan single malt Scotch whisky, joined The Edrington Group in 2002 having held marketing positions working with Imperial Tobacco, the BBC and Bass. Commenting on his new appointment, Matthew Turner, said: “I am immensely proud to be working on Highland Park - a brand whose heritage, history, whisky quality and reputation amongst whisky lovers and connoisseurs alike is unmatched. 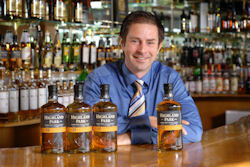 Ken Grier, Director of Malts at The Edrington Group, said: "I wish Matthew every success in his new position as brand controller for Highland Park. The brand has had impressive growth since we set out on an ambitious £18 million master plan for the spirit in 2005. The Highland Park portfolio is distributed globally with key markets being the UK, USA, Global Travel Retail and the Nordics.